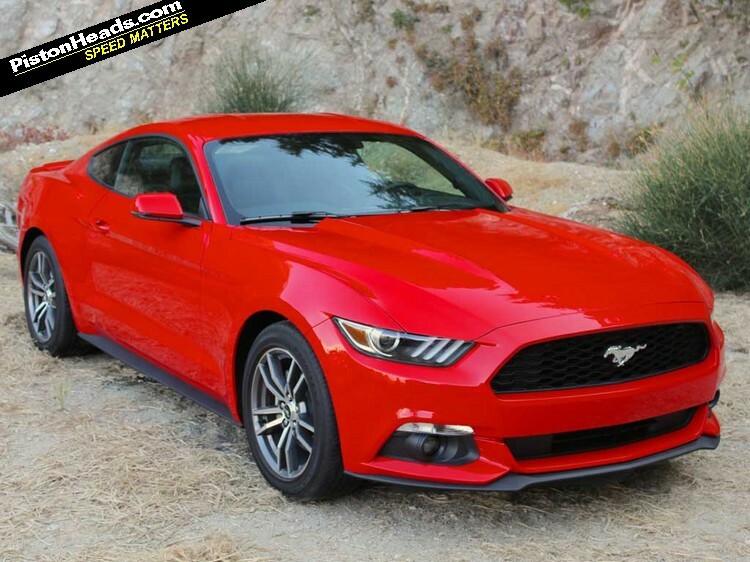 So let's start with the good: the new Mustang is, for the most part, a vast improvement over any of its predecessors. We've only driven it in the US and will obviously wait until it touches down over here (with the steering wheel on the proper side) to deliver a full verdict - a line you can cross straight off the journo cliche bingo card - but first impressions are overwhelmingly positive. For a start, it looks as good in the metal as it does in the pictures. 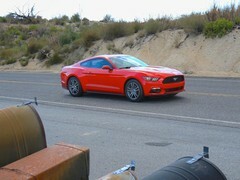 Definitely a Mustang, but far more sophisticated and curvaceous than its slabby-sided predecessor. 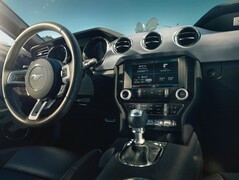 The cabin manages the same trick - plenty of traditional Mustang cues like deeply cowled instruments and a big-bossed steering wheel along with lots of shiny trim - but with quality that's gone up dramatically over its predecessor. Let your fingers explore for long enough and they'll find some cheap feeling plastics, but the stuff owners will touch everyday feels properly solid. Well the big news - other than the RHD cars we'll be getting towards the end of next year - is the new option of a 2.3-litre turbocharged Ecoboost four-cylinder. Before you reach for the pitchfork yourself it's worth bearing in mind that this isn't the first turbo four-pot Mustang as there was an SVO version in the early 1980s. In the US the Ecoboost sits in the middle of the range, between the rental-spec V6 and full-on V8 GT, but in Europe we won't get the V6. 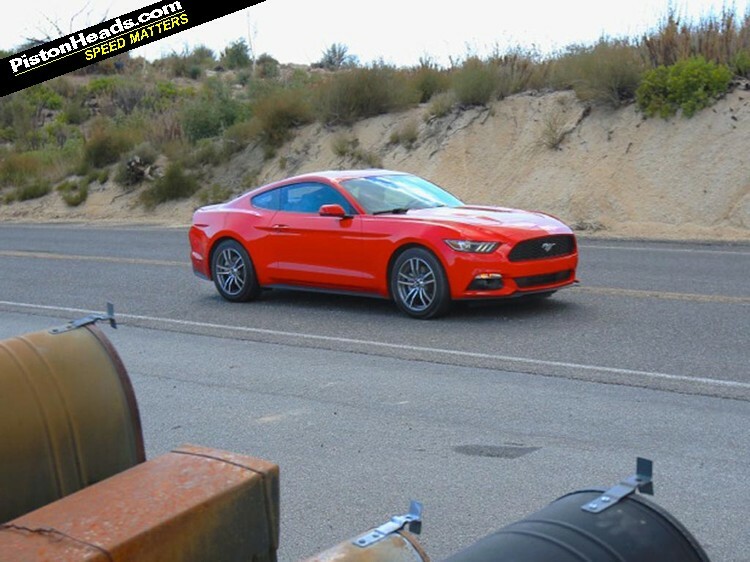 And although the Mustang is always going to sound better with the proper Bullitt soundtrack of the V8, the Ecoboost is definitely the one that's going to make most sense on this side of the pond. Ford claims 310hp, 320lb ft and a US highway economy figure of 32mpg that should translate into something over 40mpg on the official NEDC test. First impressions are good: the motor fires into life with a nice hard-edged exhaust note and there's appropriately Mustang urge low down. The car we drove was fitted with the optional six-speed auto, but even working through the slush of the torque converter throttle response is decent and there's little lag. At everyday speeds, it works well. Ask for more and the engine breaks sweat. It's been tuned to deliver best in the mid range and it starts to feel breathless well before it gets to the 6,500rpm redline and the soundtrack gains a harshness that suggests the motor isn't really appreciating the workout. 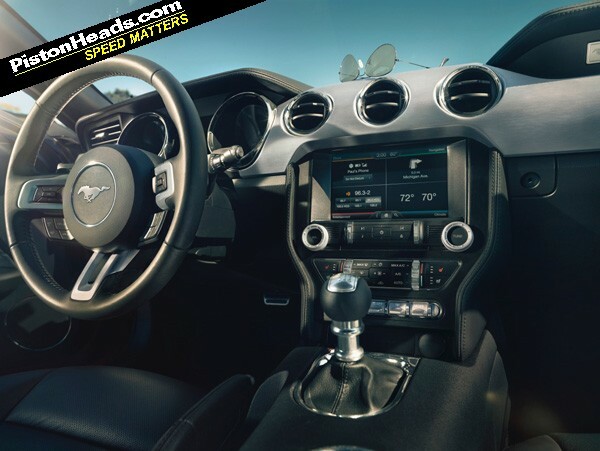 There's less at the top end than the brawny low-down response has led you to expect; the Mustang is plenty fast in absolute terms - a mid-5s 0-60mph according to US magazines - but you feel a bit short-changed when you try to rev it out. Praise for the chassis is unambiguous, though. All versions of the new 'Stang ride on an independent rear suspension, and it the car feels both structurally stiffer and more compliant than the last Mustang. It's still a big car - the official US kerbweight is 1,600 kg - but it hides its mass well and rides well over the sort of rough surfaces that would have got the last Mustang crashing about like an aircraft drinks trolley in heavy turbulence. So is it good enough for Europe? On first impressions, yes. 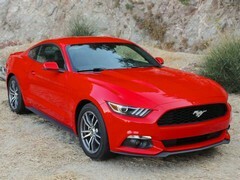 The Mustang looks great, drives well and should cost under £30,000 when it arrives in right-hand drive form next year. 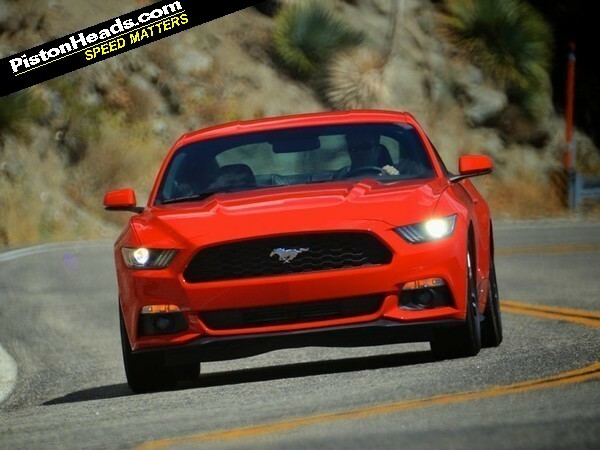 The Ecoboost engine is effective if not particularly inspirational, but shouldn't be ridiculously expensive to run. As such it's probably best seen as the spiritual successor to a 2.0S Capri rather than a tyre-smoking muscle car. And that's meant as a compliment. At £29k this has got the potential to really take it to the hyper-hatch brigade! Depending on spec levels, it could be a very compelling proposition. 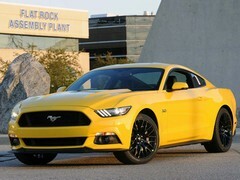 People will moan that it's not a real 'stang without a V8 but with 310bhp it should go well enough. I hope it's a success. I'm not a fan. 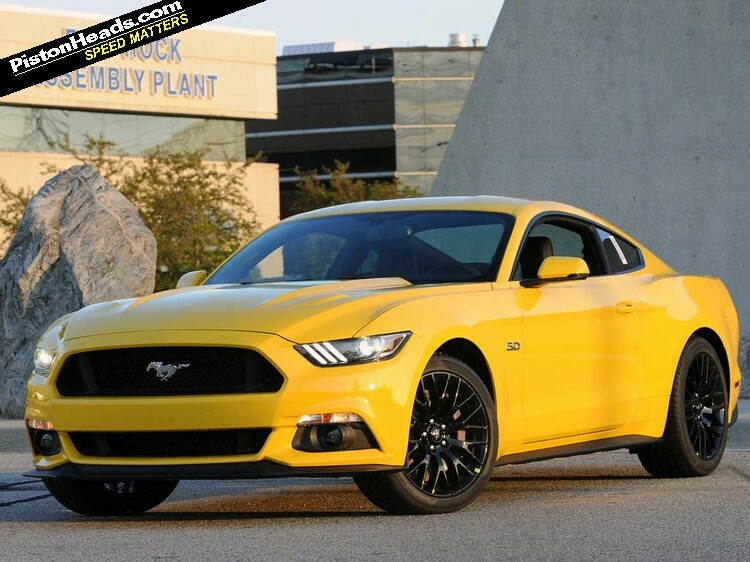 The specs and price are impressive but it's not what a Mustang should be. Economical, small engined and refined are three motoring terms that should never ever be considered when buying a Mustang. Turbo vs Naturally Aspirated though. Totally different engine application.